The most popular gemstone. The hardest known substance. An amazing number of uses. Diamond Crystal: A gem-quality diamond crystal in the rock in which it was formed. It is an octahedral crystal with triangular dissolution features on its surface and an estimated weight of about 1.5 carats. From the Udachnaya Mine, Yakutia, Siberia, Russia. Specimen and photo by Arkenstone / www.iRocks.com. 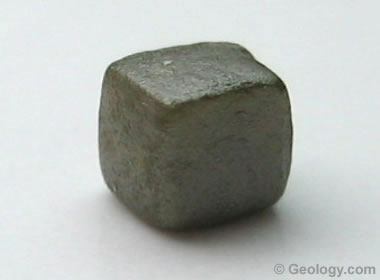 Diamond is a rare, naturally-occurring mineral composed of carbon. Each carbon atom in a diamond is surrounded by four other carbon atoms and connected to them by strong covalent bonds - the strongest type of chemical bond. This simple, uniform, tightly-bonded arrangement yields one of the most durable and versatile substances known. Diamond is the hardest known natural substance. It is also chemically resistant and has the highest thermal conductivity of any natural material. These properties make it suitable for use as a cutting tool and for other uses where durability is required. Diamond also has special optical properties such as a high index of refraction, high dispersion, and high luster. These properties help make diamond the world's most popular gemstone and enable it to be used in specialty lenses where durability and performance are required. Because diamond is composed of the element carbon, many people believe that it must have formed from coal. This is still taught in many classrooms - but it is not true! Color Most diamonds are brown or yellow in color. The jewelry industry has favored colorless diamonds or those that have a color so subtle that it is difficult to notice. Diamonds in vivid hues of red, orange, green, blue, pink, purple, violet, and yellow are extremely rare and sell for high prices. A few white, gray and black diamonds are also cut and used as gems. Most industrial grade diamonds are brown, yellow, gray, green and black crystals that lack the color and clarity to be a good gem. Streak Diamond is harder than a streak plate. Its streak is known as "none" or "colorless"
Luster Adamantine - the highest level of luster for a nonmetallic mineral. Cleavage Perfect octahedral cleavage in four directions. Mohs Hardness 10. Diamond is the hardest-known mineral. However, the hardness of diamond is directional. It is hardest parallel to its octahedral planes and softest parallel to its cubic planes. Diagnostic Properties Hardness, heat conductivity, crystal form, index of refraction, dispersion. Uses Gemstones, industrial abrasives, diamond windows, speaker domes, heat sinks, low-friction microbearings, wear-resistant parts, dies for wire manufacturing. In 2018, imports of diamonds into the United States for consumption totaled about $26 billion. Imports for consumption of all nondiamond gemstones totaled about $2.0 billion. These statistics clearly show that diamond is the most popular gemstone with U.S. consumers by an enormous margin. The United States accounted for about 35% of the world's diamond consumption, making it the leading diamond consumer. Diamonds are not native to Earth's surface. Instead they form at high temperatures and pressures that occur in Earth's mantle about 100 miles below Earth's surface. A detailed article that explains the four sources of diamonds found at Earth's surface. Most of the diamonds that have been discovered were delivered to Earth's surface by deep-source volcanic eruptions. These eruptions begin in the mantle, and on their way up they tear out pieces of mantle rock and deliver them to Earth's surface without melting. These blocks from the mantle are known as xenoliths. They contain diamonds that were formed at the high temperature and pressure conditions of the mantle. People produce diamonds by mining the rock that contains the xenoliths or by mining the soils and sediments that formed as the diamond-bearing rocks weathered away. Some diamonds are thought to form in the high temperature-pressure conditions of subduction zones or asteroid impact sites. Some are delivered to Earth in meteorites. No commercial diamond mines have been developed in deposits with these origins. Did you know? Diamonds are mined in Canada and Arkansas. Leading diamond producers: This chart shows the estimated annual production of gem-quality diamonds, in millions of carats, for the world's leading diamond-producing nations. Graph by Geology.com. Data from USGS Mineral Commodity Summaries. Learn about the countries that produce diamonds. Gem diamonds are diamonds with color and clarity that make them suitable for jewelry or investment use. These diamonds are rare and make up a minor portion of worldwide diamond production. Gemstone diamonds are sold for their beauty and quality. Natural diamond crystals have a specific gravity that ranges between approximately 3.4 to 3.6. This range exists because most diamonds contain impurities and have irregularities in their crystal structure. Gem-quality diamonds are the most perfect diamonds, with minimal impurities and defects. They have a specific gravity that is very close to 3.52. Industrial diamonds are mostly used in cutting, grinding, drilling, and polishing procedures. Here, hardness and heat conductivity characteristics are the qualities being purchased. Size and other measures of quality relevant to gemstones are not as important. Industrial diamonds are often crushed to produce micron-sized abrasive powders. Large amounts of diamonds that are of gemstone quality but have a shape or size that can not be cut are sold into the industrial diamond trade. A demonstration of dispersion: How white light is separated into its component colors while passing through a prism. Diamonds have a high dispersion. NASA Image. Diamond fire: A round brilliant cut diamond showing "fire." Image copyright iStockphoto / Greg Stanfield. Diamonds are the world's most popular gemstones. Many times more money is spent on diamonds than on all other gemstones combined. Part of the reason for diamond's popularity is a result of its optical properties - or how it reacts with light. Other factors include fashion, custom, and aggressive marketing by diamond producers. Diamonds have a very bright luster - the highest non-metallic luster - known as "adamantine." Their high luster gives them the ability to reflect a high percentage of the light that strikes their surface. This is one property that gives diamond gemstones their "sparkle." And, when a diamond is being fashioned into a gem, the facet angles are planned to reflect a maximum amount of light from its internal surfaces. Diamond also has a high dispersion. As white light passes through a diamond, this high dispersion causes that light to separate into its component colors. Dispersion is what enables a prism to separate white light into the colors of the spectrum. This property of dispersion is what gives diamonds their colorful "fire." Argyle diamonds: Octahedral diamond crystals from the Argyle Mine of Western Australia. 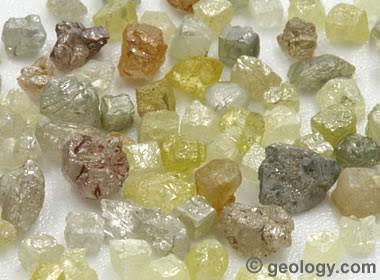 The Argyle Mine produces diamonds in a wide range of colors. Most Argyle diamonds are brown, some are near colorless, and a very rare number are red, pink, blue or violet. It is the world's only consistent producer of pink diamonds. Rare red, blue, and violet diamonds are also found at Argyle. Image copyright 2016 Rio Tinto. The quality of a diamond that has been faceted into a gem is primarily determined by four factors: color, cut, clarity, and carat weight. A standardized method of assessing diamond quality was developed in the 1950s by the Gemological Institute of America and is known as "The 4Cs of Diamond Quality" . 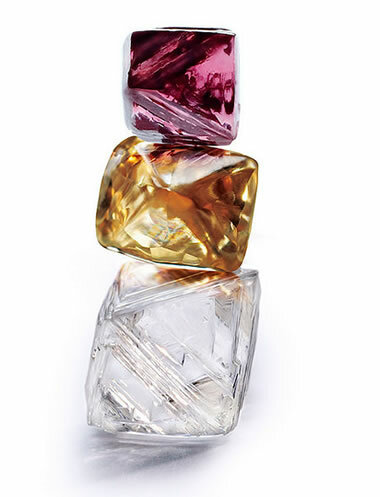 Color: Most gem-quality diamonds range from colorless to slightly yellow, brown, or gray. The most highly regarded and valuable diamonds are those that are completely colorless. These are the ones sold for the highest prices. However, another category of diamond gemstone is increasing in popularity. These are colored diamonds, which occur in a variety of hues including red, pink, yellow, orange, purple, blue, green and brown. An article about the popularity of colored diamonds and how they obtain their wonderful colors. The value of colored diamonds is based upon the intensity, purity and quality of their color. Those with a saturated, vivid color are called "fancy-color diamonds" or "fancies". On average, only one diamond in 10,000 has a color that earns the "fancy" designation. This rarity makes fancy-color diamonds extremely valuable. Some of them have sold at auction for over one million dollars per carat. They are some of the world's most spectacular diamonds. Clarity: The ideal diamond is free from fractures and inclusions (particles of foreign material within the gem). These detract from the appearance of the gem and interfere with the passage of light. When present in large numbers, dark colors, obvious positions or sizes then will significantly degrade the appearance of a cut gem and lower its value. They can also reduce the strength of the stone. Cut: The quality of design and craftsmanship used in cutting a diamond is what determines its appearance. The angles to which the facets are cut, the proportions of the design and the quality of the polishing are what determine its face-up appearance, brilliance, scintillation, pattern and fire. Ideal stones are perfectly polished to be highly reflective and emit a maximum amount of fire. The faceted faces are equal in size and identical in shape. And, the edges of each faceted face meet perfectly with each of its neighbors. Carat: Diamonds are sold by the carat (a unit of weight equal to 1/5th of a gram or 1/142nd of an ounce). Small diamonds usually cost less per carat than larger stones of equal quality. 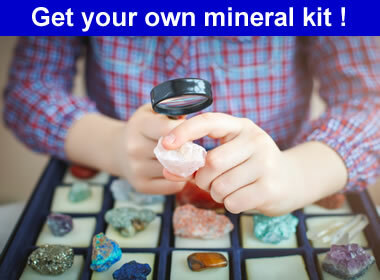 This is because very small stones are very common and large stones are exceptionally rare. Industrial Diamonds: Small diamonds, less then 1 millimeter in size, that are suitable for industrial use as abrasive granules. 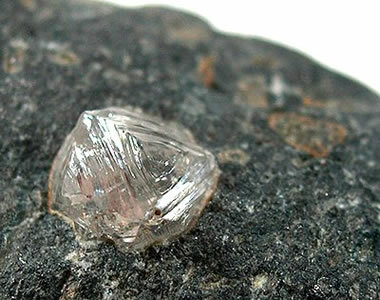 Industrial diamonds might be polycrystalline, have numerous inclusions, have poor clarity, contain fractures, have a small size, or have some other characteristic that disqualifies them from gem or technology uses. Cubic Diamond Crystal: A green diamond crystal. The color and cubic crystal shape are natural. Many natural diamond crystals are cubic or octahedral in shape. This diamond is about 4 millimeters across and is suitable for industrial use. 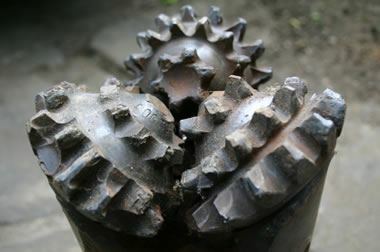 Diamond Drill Bit: A drill bit used in the drilling of oil wells. Each of the cutting tips has small grains of diamond embedded in the metal. These cut their way through the rock as the bit turns. Image copyright iStockphoto / mikeuk. Diamond concrete saw: A concrete saw with a diamond blade of about three feet diameter. 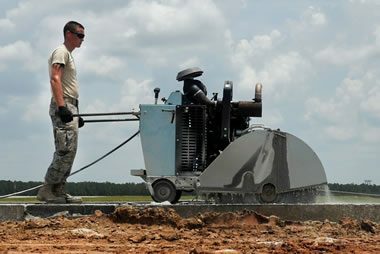 Saws of this type are usually cut under a water spray that cools the blade, removes cuttings and prevents the production of airborne dust. Saws of this type are a common sight where highway or other concrete work is being done. US Air Force Image. Because diamonds are very hard (ten on the Mohs scale) they are often used as an abrasive. Most industrial diamonds are used for these purposes. Small particles of diamond are embedded in saw blades, drill bits and grinding wheels for the purpose of cutting, drilling or grinding hard materials. They might also be ground into a powder and made into a diamond paste that is used for polishing or for very fine grinding. The traditional methods used for cutting diamond into gems and polishing their surfaces involve using small particles of other diamonds as the cutting and polishing media. are a rare variety of diamonds. They have the same hardness as diamond but are much tougher because they are polycrystalline. The worldwide demand for industrial diamonds greatly exceeds the supply obtained through mining. Synthetic diamonds (diamonds made by people) are now being produced to meet this industrial demand. They can be produced at a lower cost per carat than mined diamonds and they perform just as well in industrial use. Most industrial diamonds are used as abrasives. However, diamonds are used in many other applications. are made from thin diamond membranes and are used to cover openings in lasers, x-ray machines, and vacuum chambers. They are transparent, very durable, and resistant to heat and abrasion. enhance the performance of high-quality speakers. Diamond is a very stiff material, and when made into a thin dome it can vibrate rapidly without the deformation that would degrade sound quality. are materials that absorb or transmit excess heat. Diamond has the highest thermal conductivity of any material. It is used to conduct heat away from the heat-sensitive parts of high-performance microelectronics. are needed in tiny mechanical devices. Just as some watches have jewel bearings in their movements, diamonds are used where extreme abrasion resistance and durability are needed. can be produced by coating surfaces with a thin coating of diamond. In this process, diamond is converted into a vapor that deposits on the surface of parts prone to wear. Mohs - Vickers hardness comparison: This chart compares the hardness of index minerals of the Mohs hardness scale (an integer scale) with their Vickers hardness (a continuous scale). Mohs hardness is a resistance to being scratched, while Vickers hardness is a resistance to indentation under pressure. The graph shows the great difference between the Vickers hardness of corundum and diamond - which are only one unit apart on the Mohs hardness scale. Although diamond is known as the world's hardest natural material and has been assigned a hardness of 10 on the Mohs hardness scale, that information is an oversimplification. Diamond crystals vary in hardness by direction. The direction of greatest hardness is parallel to the octahedral crystal planes. When diamond crystals are being cut and polished into gems, it is very difficult to cut them in that direction with a diamond saw. So instead of using a diamond saw or the traditional practice of breaking them by cleaving, much of this work is now done by laser sawing. Facets cut parallel to the octahedral crystal direction are also difficult to polish, so cutters either change direction or risk leaving a "lizard skin" texture on the facet. The softest direction in a diamond crystal is parallel to the cubic planes. The best polishing is done on facets that are parallel to that direction. Although that is the softest direction in a diamond, the hardness is several times harder than corundum, the second-hardest mineral of the Mohs hardness scale. Diamond simulants: The photos above compare strontium titanate, moissanite, and cubic zirconia with diamond. Moissanite and cubic zirconia have dispersions that are competitive with diamond, and the dispersion of strontium titanate is over-the-top. In the photo above, the strontium titanate is a 6-millimeter round. The other stones are 4-millimeter rounds. This difference in size does give strontium titanate an advantage. Diamond simulants are materials that look like diamonds, but they have different chemical compositions. Diamond simulants can be natural materials such as colorless zircon or sapphire. More often they are man-made materials such as cubic zirconia (ZrO2), moissanite (SiC), YAG (yttrium aluminum garnet Y3Al5O12), or strontium titanate (SrTiO3). Synthetic diamonds of various colors grown by the high-pressure high-temperature technique. Image by Wikipedia contributor Materialscientist. Diamond is a very valuable material, and people have been working for centuries to create them in laboratories and factories. Synthetic diamonds are man-made materials that have the same chemical composition, crystal structure, optical properties and physical behavior as natural diamonds. Other names used for these man-made diamonds include: "lab grown," "created," "lab-created," "man-made," and "cultured." These names properly indicate that the diamonds were not naturally formed in the Earth, but they were instead created by people. The first commercially successful synthesis of diamond was accomplished in 1954 by workers at General Electric. Since then, many companies have been successful at producing synthetic diamond suitable for industrial use. Today, most of the industrial diamond consumed is synthetic, with China being the world leader with a production of over 4 billion carats per year. Most of the important industrialized nations are now able to produce synthetic diamonds for industrial use in factories. In the last decade, several companies have developed technology that enables them to produce gem-quality laboratory-created diamonds up to a few carats in size in several different colors - including colorless. Some companies use high-pressure, high-temperature methods - these are known as HTHP diamonds. 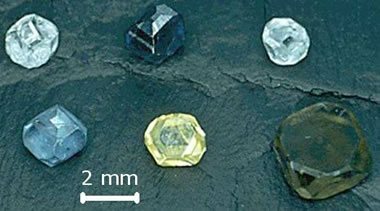 Others create diamonds using a chemical vapor deposition process - these are known as CVD diamonds. Their man-made gems are being sold in jewelry stores and on the internet at a significant discount to natural stones of similar quality and size. They have a beautiful appearance and an attractive price tag. Synthetic diamonds are required to be sold with a disclosure that they are "synthetic" or "laboratory-created." Mineral Commodity Summaries 2017: U.S. Geological Survey, January 2017. Gemstones: Donald W. Olson, U.S. Geological Survey, 2013 Minerals Yearbook, March 2016. Diamond, Industrial: Donald W. Olson, U.S. Geological Survey, 2016 Mineral Commodity Summaries, January 2016. Diamond, Industrial: Donald W. Olson, U.S. Geological Survey, 2013 Minerals Yearbook, December 2015. Diamond Quality Factors: An explanation of how diamonds are evaluated using the 4Cs. Gemological Institute of America. Last accessed April 2019. 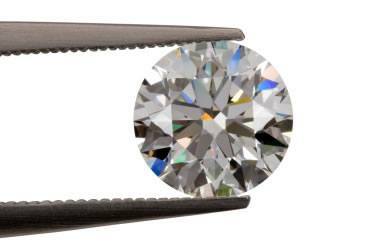 Will Consumers Accept Synthetic Diamonds? Synthetic diamonds have been the dominant type of diamond in industrial applications since the end of the 20th century. Most of the diamonds used to make abrasives and cutting tools are now synthetic. Virtually all diamonds used to make windows, speaker domes, heat sinks, low-friction microbearings, wear-resistant parts, and other technology products are now synthetic. Synthetic diamonds are less costly than mined diamonds, have more consistent properties, and are becoming available in made-to-order specifications. There are no emotional barriers for synthetic diamonds to replace mined diamonds in these uses. In the jewelry industry there is considerable debate about the willingness of consumers to accept synthetic diamonds. Some believe that jewelry consumers want "real diamonds" - meaning "mined diamonds." Others believe that synthetic diamonds will be favored by people who dislike the human rights and environmental problems associated with mined diamonds. However, the real motivator will likely be price. Currently, synthetic diamonds made for jewelry use have a 15 to 30% price advantage on mined diamonds. This will likely be the greatest motivator for consumers to accept synthetic diamonds. Observation and speculation.... If you walk into almost any mall jewelry store and look into the cases where ruby, sapphire, and emeralds are being sold, you will often see that most of the stones being offered are synthetic. A person with very little training can often recognize them by their bright color and nice clarity. The synthetic materials have a superior appearance and their prices are small compared to natural gems of similar size and apparent quality. Consumers get better appearance for a lower price, and the majority of them have accepted that transaction. The battle for emotion and sales dominance in the popular-price ruby, sapphire, and emerald market was won by synthetics decades ago. In the next decade the diamond market might also move in favor of synthetics. It's already starting as synthetic diamonds take a visible position in the market. The price of synthetic diamonds will likely decline as more and more machines to produce them are placed into service, become more efficient, and competition among manufacturers intensifies. Eventually, the price differential between natural and synthetic diamonds will be greater than many customers will be able to ignore, and they will buy synthetic. If the next world-class advertising campaign promotes synthetic diamonds, a huge shift in consumer demand might occur.